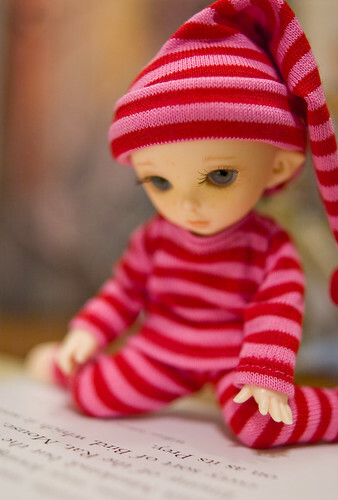 Check out Doll-Lite for an interview I did for them. 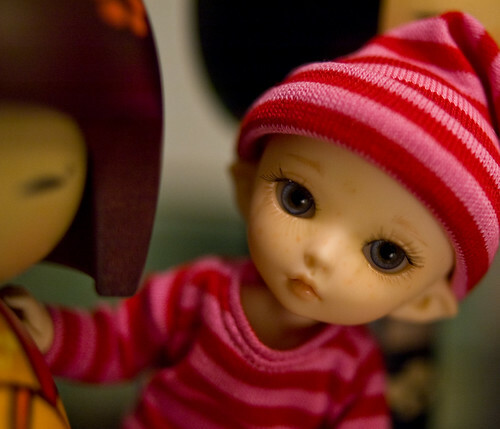 If you haven’t visited them before they have some great interviews with artists and craftspeople working in the doll hobby. 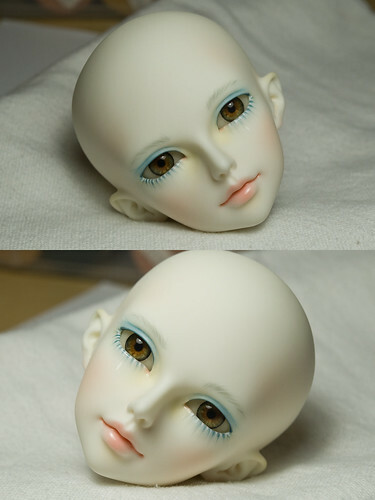 Doing a faceup on a BJD. 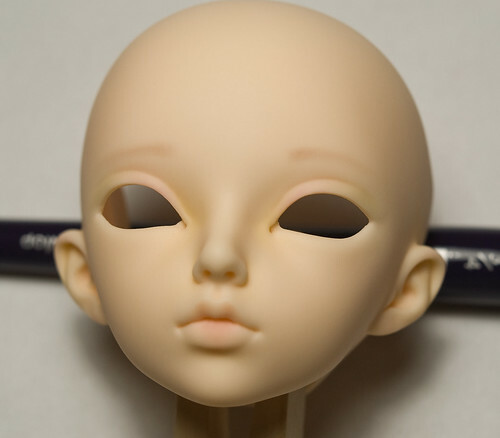 In this post I’m going to share the process I use when doing a doll’s faceup. Just a warning its a little long with lots of pictures. I’m using my new minifee rhiea for this example. I took pictures along the way while doing her faceup last night and I’ve combined a couple of steps into one picture or this post would have gone on forever. 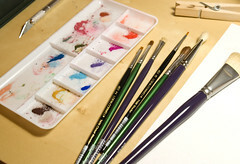 Rembrandt Pastels and assorted brushes and Golden liquid acrylics. 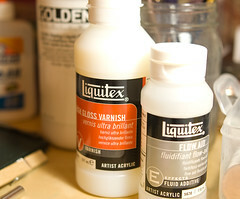 I also use Golden Retarder, Liquitex High Gloss Varnish, and Liquitex Flow Aid. In the next picture I have added eye color, a bit of blush, and more lip color. 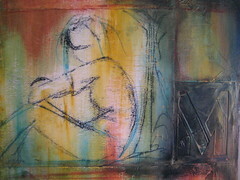 These things were built up slowly with light sprays of MSC in between to keep the pastels from looking dirty. I’ve done the lips lines here. I don’t like real strong lines so after painting them on I go over them with another damp brush. 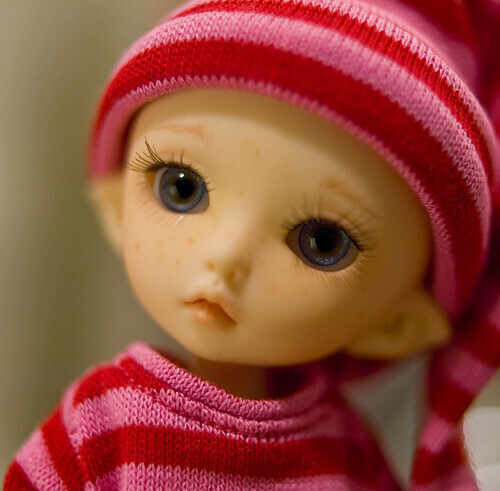 I like the depth that the lines give to the doll’s lips. I also put a bit of watered down red in the corners of the eye. My picture of the gloss didn’t come out so we skip ahead a bit. I do at least three layers of gloss on the lips. Gloss on the top inside of the eye and the bottom inside, as well as, the corners. 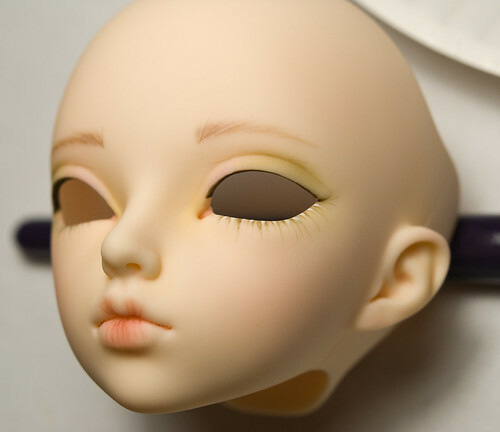 I also gloss a few eyelashes and eyebrow hairs. 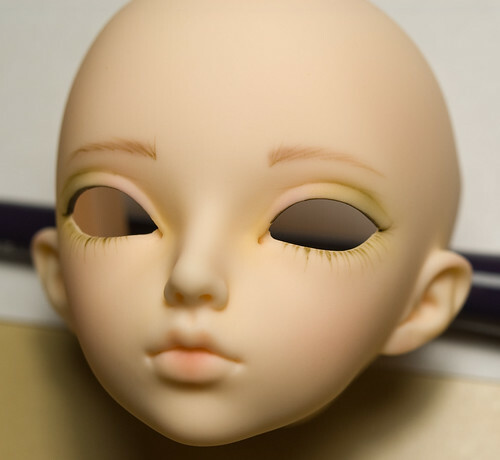 As a last step I usually put in a few white eyelashes to brighten the eyes. I added this picture in to show how I put in the eye lashes. This is the method that works the best for me. 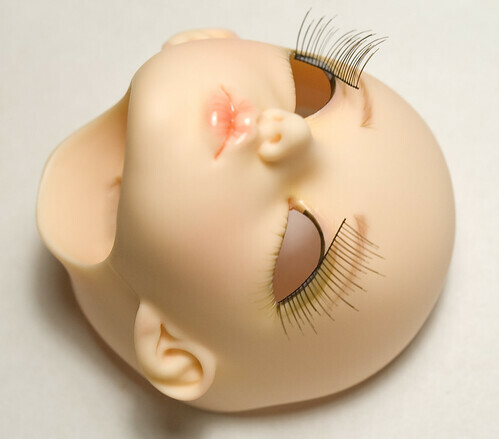 I soak the eyelashes for a just a bit in some Windsor and Newton brush cleaner, this gets off that gummy residue. 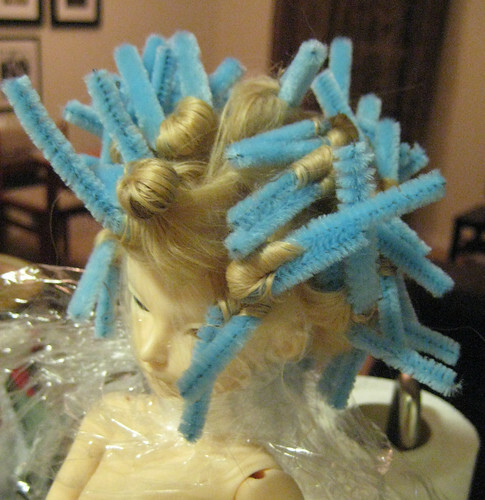 I then glue on the outside half first, holding the lash with a pin until it sticks before doing the other half. Here’s the finished picture with some temporary eyes stuck in. I’m happy with the outcome. I was on a roll and completed this one in one night. 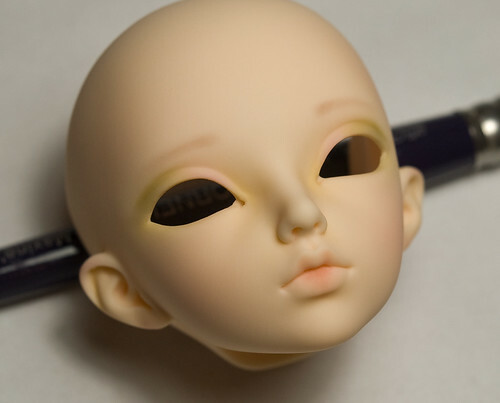 Typically it takes me several nights to finish a faceup especially when I have my day job to worry about as well. I got my shipping notice for the two dolls I ordered back in December. Waiting this long has killed me. While waiting I have purchased a couple things for their arrival. These dresses were made by Honeythorpe. 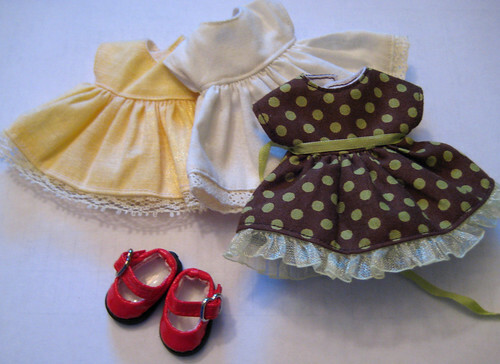 She makes the cutest little dresses for pukifee and littlefee. Here are some of the fabrics I got for a dress for my new minifee rheia. The shoes I’ve had for a long time. 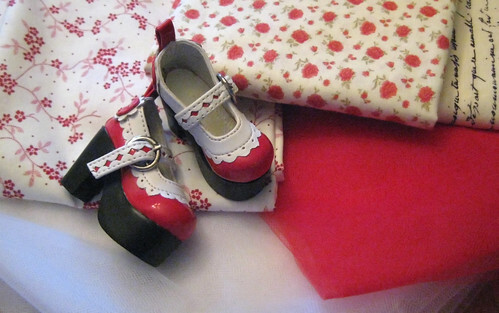 I was hoping the dolls would come before this week so I could do some sewing over spring break. Maybe they’ll arrive on Saturday. This is the 3rd anthro doll I’ve done and I think its my favorite. You can’t resist that smile. 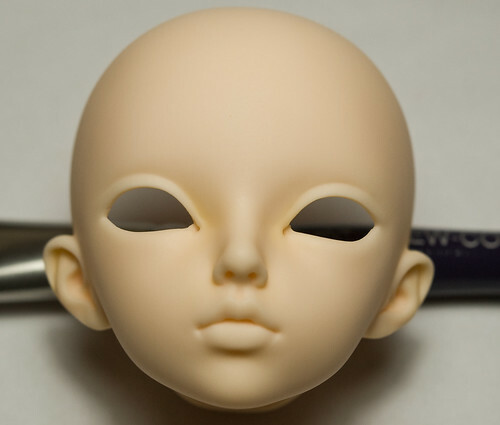 I’ve added to my faceup thread on DOA that I will blush paws or manicure hands for free with a faceup commission.